In this qigong series, Zayne will introduce an integrated system of energy practices that promote aliveness, vibrant health, creativity, and happiness for no reason! En-Joy the warm and delicious sensations of free flowing energy in the body as we return to the natural state through committed practice—a vow to make to yourself that seeds so much possibility for transformation; physically, emotionally, and spiritually. *Reclaim an aliveness and joy of being that pre-dates our stories, patterns, habits and automated reactions to life. *Co create with life energy and become...new. *Promote healing, fostering wholeness and heart centered serenity. *Discover why and how qigong is a science of miracles. In this series, Zayne will introduce an integrated system of energy practices that promote aliveness, vibrant health, wholeness and happiness for no reason! *Wisdom Healing (Zhineng) Qigong’s Tradition and founder, grandmaster Dr Pang Ming who synthesized secret teaching of 19 grandmasters of energy work into Wisdom Healing)(Zhineng) Qigong, and founded the largest medicine-free, qigong hospital in the world with 95% scientifically proven effectiveness. *“Meet” his direct teacher, Master Mingtong Gu who is translating and transmitting Dr Pang’s teachings to the western world, and founded the Chi Center, North America’s first qigong healing center located in Galisteo, NM. *Informal practices to harmonize with source energy, anywhere, anytime: Chi Field setting, inner smile meditation, Haola chant to activate natural goodness, our divine blueprint, resonance and harmonize with the energy universe. Instructor Zayne Marston is a seeker and a finder of vibrant health and vitality who knows that we each have the power to transform our mind/body/spirit if we commit ourselves; “It is never too late”. Inspired by the transformative results he has received from practicing qigong since 1992, Zayne shares his discoveries with fellow seekers, offering both individual and group instruction. He is known for his informative, inspiring, playful and life-changing classes and joyfully transmits both the fundamentals and the spirit of this special art/science to his students. In 2016 Zayne enrolled in as a teacher in training for Wisdom Healing Qigong. After 3 years of study and intensive practice he received certification to teach Level One Wisdom Healing Qigong and the Awakening Vitality Method. Zayne's Vision. Currently Zayne is enrolled in a year of intensive teacher program with Master Zhu. One of the hidden blessings of life tragedy is that it can take you to a place you normally would never have ventured. I'm discovering how liberating it is to be beginner again--free of the familiar, the conditioned. After nearly a quarter century of qigong practice, I enrolled in a professional development program 3 years ago and earned my Level 1 teacher certification of a powerful qigong system called Wisdom Healing (Zhineng) Qigong (Oct 2017). It is taught by master Mingtong Gu, who learned from his teacher, Grandmaster Dr. Pang Ming. Dr Pang founded the largest qigong hospital in the world with a 95% scientifically proven effectiveness in healing disease and illness. The first practice I learned was Emotional Healing Qigong, or Five-Organ Intergrative Sound Healing. Using the voice of sound, consciousness and feeling, negative emotions are rapidly transformed, balanced and harmonized with all level of our being. It helped me tremendously with grief. I have since learned other practices of Wisdom Healing (Zhineng) Qigong system that complement each other; Lift Chi up Pour Chi Down and Awakening Vitality (spinal awakening method) example , and the practice of Lachi which cultivates a healing energy ball from the universe. I am currently enrolled in a new, year long teacher program of study with a high level teacher close to Dr Pang--Master Zhu, who taught me Body-Mind Form, another powerful practice of this system. After 2 months of practice, the chronic pain in my feet/ankles has subsided as well as the arthritis in my fingers. A pleasant surprise and illlustration of the "ordinary miracles" that can happen when you practice. Above and beyond the practices this is a way of life to bring joy and happiness to our lives. I look forward to sharing. Qi (Chi or Chee): The fundamental life force that permeates all things. Qi connects and animates everything in the universe. When the flow of Qi is impaired, we have disease. When it flows easily, we have perfect health. Qigong (energy work or skill): The art and science of using breath, movement, mind and meditation to cleanse, strengthen, absorb, and circulate the blood, lymph and vital life energy. and miracle of your being! *Class led by Zayne Marston, Sharing inspired teachings of Mingtong Gu, Wisdom Healing Qigong master. Also spinning Silk Reeling magic with John Meyer! It’s hard to keep a good thing secret. I am moved to share about a powerful qigong ( chi kung, means energy practice) I’ve been learning called Five Organ Integrative Sound Healing Method; a practice of a system called Wisdom Healing (Zhineng) Qigong. This magical practice is easy and flexible to perform and highly effective at dissolving energy blocks caused by chronic, limiting emotions. What it would be like to have a self-healing tool that can help transform the roller coaster ride of emotions spawned from the past into a refined state of being that is positive, life affirming, and more reflective of our true nature? Sound Healing Qigong uses the voice of sound, consciousness and feeling to make contact with and to deeply receive source energy that’s all around us—the Creative Force of Healing Light, in different language, the Holy Spirit —unseen by the naked eye, yet animating and permeating all life, within and without. Through vibration and focused intention, the sounds voiced by the practitioner neutralize discordant energy moving through the organs, which our brains interpret as emotion. Personally, this rare and unique qigong has helped me with grief in particular—getting me through the dark night—having lost my beloved wife a year ago. Through daily qigong practice and my willingness to embrace all feelings and face the dark night, I am transforming on many levels. Anxiety, fear and heavy sorrow that sprang from my loss no longer plague me as they did. An effervescent joy, a love, a spring to my spirit, are bubbling up out of someplace deep inside me to fill the vacuum. What happened? 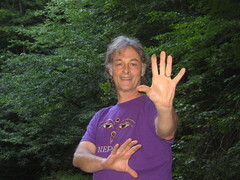 To be included in 9 week WIsdom Healing Qigong Program, SHELBURNE FALLS YOGA Sundays 11:00-12:00 PM! FEB 3-March 24, Also Sound Healing Saturday (every third Saturday. 1:30-4:30 pm),GREENDFIELD CLASSES TBA. Chi Party at your home: bringing qigong to YOU.